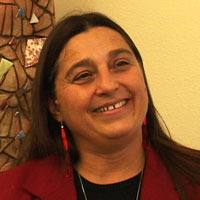 Maylinn Smith is an associate professor of law at the University of Montana Law School, where she also serves as the clinical supervisor and director of the Indian Law Clinic. She has also been the Chief Judge of the Southern Ute Indian Tribal Court, an Appellate Judge for various Tribal Court of Appeals, as well as a legal advisor for the Salish and Kootenai Tribal Court. Her interview focuses on the history of treaties and the legal basis for them. Montana Treaties and Sovereignty: Two Examples - Maylinn Smith. Indian Land and Federal Policy - Maylinn Smith.